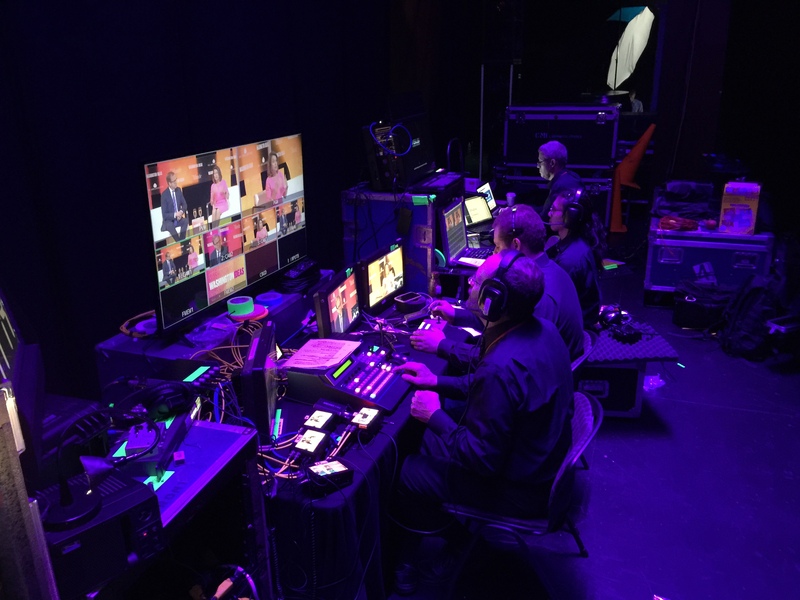 Astrocasters video team running a live stream backstage at the Washington Ideas Forum (aka the Atlantic Festival). We have done work over the years with Atlantic Live Events (run by the same folks as The Atlantic Magazine), filming and streaming the Washington Ideas Forum (Now called the Atlantic Festival). They’ve had some great speakers in their lineup, and have done a good job promoting their content, speakers, and sponsors on social media. This is the full coverage of a day of speakers, as originally live-streamed on their YouTube channels. The stream includes all of the sessions as well as various holding slates used during the times when there was no programming. The long form coverage was edited down and individual clips were created, one for each speaker, as seen in this video posted to YouTube. Note that the tweet includes the Twitter handles for the interviewer (Andrea Mitchell) and the Interviewee (Madeleine Albright) as well as the hashtag for the event (#WashingtonIdeas) and a link to a site where someone can watch the live stream. (washingtonideas.splashthat.com) Using an intermediate page to show your live stream is preferable to sending people directly to YouTube. A custom landing page allows you to present related content, capture greater analytics, and have more control of the branding. A few short segments of her interview were cut into short segments and shared on Twitter DURING her talk. (You can click on the play button below to view the short clip). In general we find that in terms of social media posts, (a) shorter is better than longer, and (b) faster is better than slower. Quick Clips require a team that can (a) immediately identify the "juicy" quotes as soon as they hear it, (b) quickly edit a subclip, and (c) can quickly post video to social media along with an attention-grabbing post that has all of the correct tags. An experienced team with the proper infrastructure can often have a clip posted to social media within 5-10 minutes after the words are uttered live on stage. In some cases, the live stream was cross-posted or live streamed to multiple Facebook pages at once. For example, the interview with Boeing's CEO was streamed to the Boeing Corporation Facebook page as well as the Atlantic Festival Page. This helped get the Festival content in front of a very large audience of Boeing's Facebook followers. The Festival Posted a recap video some time after the video ended, to remind people of the event. These videos were also posted to their YouTube Channel and Facebook Page. Of course, this is only a small glimpse into the myriad ways that our clients leverage social media to promote their video content to interested audiences. Hopefully it's sparked some ideas for your next presentation. Please feel free to reach out to us as you begin to plan your next event. Our event consultants would be more than happy to strategize ways to help you reach new audiences!